Highlight your rain garden and help educate your neighbors about its many benefits! 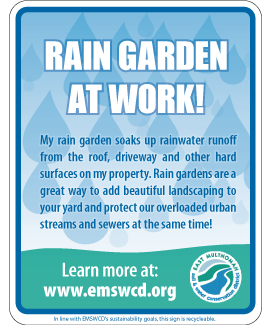 If you live in our district (in Multnomah county east of the Willamette River), and have built a rain garden that captures stormwater off your roof or other impervious surface, you can register your rain garden here! We will send you an aluminum 7×9 inch sign to install in your front yard! Help spread the word on the value of rain gardens. With everyone doing their part, our streams will be healthier and cleaner. All personal information will be kept confidential and will not be shared. Help us track of the number of rain gardens out there, and receive a free rain garden sign! Only one sign request per household, please. Where is the rain garden located? Would you like a Rain Garden sign? Yes, please send me a sign! Yes, I would be interested in having my garden be included in tours. Note: We will always contact you for permission prior to offering any tours or to take photos. Help us track our impact on stormwater by entering some basic information about your rain garden/s! How big is your rain garden? How big is the roof or other area that drains to the rain garden? Please describe your garden and tell us what plants you used. Please share any tips or lessons learned!